When Lucien got down from the mountains that fall, he was unrecognizable – bearded beyond belief, 20 lbs lighter, carrying a ton of footage, and limping. He would later be diagnosed with trauma‐induced advanced degenerative arthritis, caused by carrying the equipment day and night, and need double foot surgery. When we started to watch the footage, we realized that we had two, or more, different films. (And so many different points of view that I thought about calling the film “A Piece of the Big Sky.”) We decided the most compelling story for a theatrical film was the original one we’d been interested in: the sheep drive itself — as ritual, as history, as challenge. Even then, we had a good 200 hours of footage to wade through. Little did we know that this would take us about eight years. In the meantime, we went back up to film lambing, shearing, the following year’s sheep drive, and the one after that. We even moved to the East Coast. (We started joking that we’d call the film, “The Penultimate Sheep Drive.”) Most of the footage, however is from that first summer. In 2006, the ranch was sold, along with most of the sheep. Now the film is finally finished. As for a title, we’d started using “Big Timber,” as it was the name of the town where the drive began, but as fitting as that was for the title of a Western, it implied a film about logging. 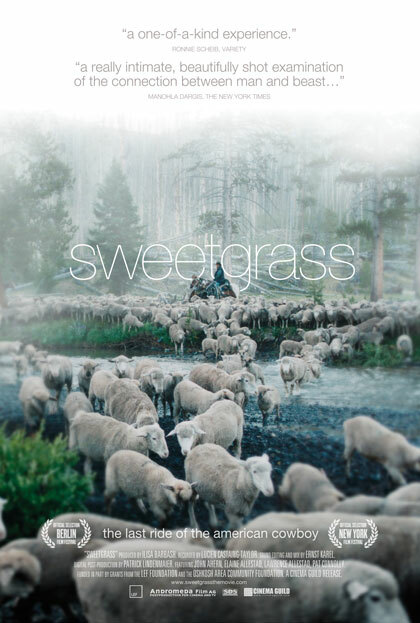 We finally settled on “Sweetgrass.” While the journey is tremendously hard, it is undertaken not just for the literal goal of reaching (sweet) grass, but also to carry on tradition against all sorts of odds. There is a silent 1925 documentary, called Grass: A Nation’s Battle for Life (1925) 1925 by Merian C. Cooper, Ernest Schoedsack, and Marguerite Harrison, about an heroic seasonal trek (transhumance) of herds and Bakhtiari herdsmen in Persia. Sweetgrass tips its hat to that film, and is a tribute to past and contemporary people who still manage to eke out a bittersweet living on the land.